There are a large and ever-increasing number of structures and buildings worldwide that are in need of refurbishment, rehabilitation and strengthening. The retrofitting of beams and slabs for this purpose is now recognized as the most cost-effective and environmentally sustainable method of carrying out this essential renovation work. 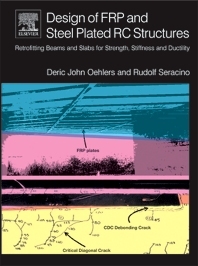 The authors of Design of FRP and Steel Plated RC Structures are both acknowledged world experts on these techniques and their book has been designed to provide the reader with a comprehensive overview of the established techniques and their applications as well as thorough coverage of newly emerging methodologies and their uses. The comparison of FRP and steel is a particular focus and the authors provide practical examples of where one material might be used in preference to another. Indeed practical, worked examples of how, when, and why specific solutions have been chosen in real-world situations are used throughout the text and provide the user with invaluable insights into the decision-making process and its technical background. Just as importantly these examples make the understanding and application of these techniques easier to understand for the student and the practitioner. The book is international in appeal, as while no reference is made to specific local codes the authors’ approach always follows that of the more advanced structural codes worldwide. As such it will remain an essential resource for many years to come. Design of FRP and Steel Plated RC Structures is an important reference for a broad range of researchers, students and practitioners including civil engineers and contractors, architects, designers and builders. Practising civil and structural engineers in research and consultancy in the construction and highway sectors. Architectural consultancy, graduate students of structural engineering, architecture. Design of FRP and steel plated RC structures. Retrofitting beams and slabs for strength, stiffness and ductility.